I absolutely love being able to use my crockpot. One of my favorite things to make is Pulled Pork Sandwiches. The issue I run into is that I always end up with tons of leftovers and I honestly cannot eat pulled pork sandwiches day after day. Have no fear though, I found a solution! Pulled Pork Baked Potatoes! These were out of this world! My trick for baked potatoes is to wash the outside of the potatoes and then prick each potato with a fork so that the heat can get inside the potato faster. I cover the potato with extra virgin olive oil and then rub on a garlic salt and pepper mixture on the outside. My mom always said that the skin of the potato is the healthiest part and this seasoning gives the skin the taste of curly fries from my favorite diner. Bake the potatoes directly on the oven rack at 425 F for an hour. Cut the potatoes in half and hollow out each half of the potatoes. Place the hollowed out portion of the potatoes into a bowl and add one tablespoon of butter and a tablespoon of milk. Beat the potatoes and add a tablespoon of salt. My husband thinks that nothing is ever salty enough so I always end up adding a bit more and checking the taste to make sure it is to his liking. I then added in about three tablespoons of leftover pulled pork and mixed it into the potato mixture. Place the mixture back into the hollowed out potato skins and back at 425 F for another 15-20 minutes. You want the potatoes to have a golden brown exterior. Add cheddar cheese to the top of the potatoes and stick them back into the oven for another 3-5 minutes. These potatoes are a meal by themselves. You won’t be disappointed by the seasoned exterior of the skin with the creamy potato pork filling topped with cheese. 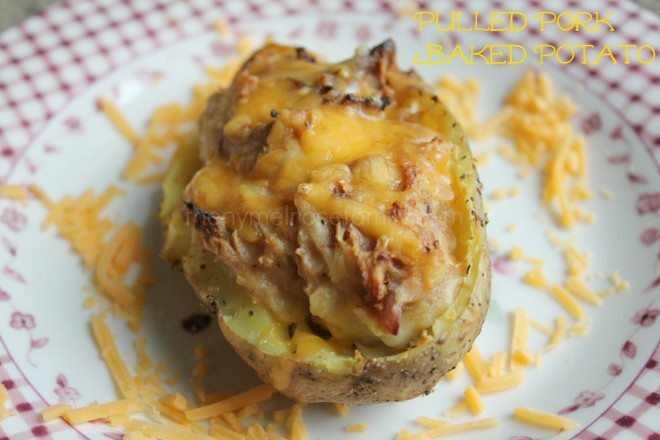 Seasoned twice bake potatoes with a creamy pulled pork filling and topped with cheddar cheese. Clean each potato and prick each with a fork. Rub extra virgin olive oil and mixture of pepper and garlic salt onto each potato. Place each potato onto the oven rack and bake at 425 F for one hour. Hollow out each potato and set aside into a bowl. Add butter, milk and salt and beat the mixture together. Check the taste to be to your flavor and creaminess. Adding more milk will make the potato mixture creamier if necessary. Mix in leftover pulled pork into the mixture and place back into each potato. Bake the potatoes with the pulled pork filling for another 15-20 minutes at 425 F on a baking sheet. Top each potato with cheddar cheese and place back into the oven for another 3-5 minutes or until the cheese is melted. Yum! Pork on my grocery list now! This is my all-time favorite comfort food. I feel so American when I eat it. Many Australians, my husband included, thinks bbq looks like someone chewed it first. I don’t care. Whenever I get homesick I make bbq and these potatoes. I first had them at Calhoun’s Restaurant in Knoxville a million years ago. SO soo good. Great idea, Jenny! I always have tons of leftovers and swear that I’ll use up the little frozen portions one day before they turn into blocks of ice. This is a great solution to that and will definitely keep it in mind the next time I do pulled pork. this looks so tasty! we do this with taco meat sometimes, but i never thought of doing it with pulled pork – yum!! Twice baked potatoes are one of our favourites, and this puts a whole new spin on them! This looks delicious! Found your blog through TFDiaries and the blog hop! OMG, this looks so amazing! I LOVE pulled pork! I will definitely make this soon! You are too sweet! I was just checking out your site. I absolutely love that Kelly green skirt. Too cute!! You are too sweet Lucy! I have to tell you that I absolutely love your happy hour party. For some reason I thought it was last night and I was literally stalking your site all night. Lol! Oh. my. goodness. This sounds so delicious. I’m definitely going to try these!!! WOW. This looks to DIE for! This looks fabulous. I am following. There’s not much of anything better than a great baked potato with something like this added. Thanks so much ….gonna make this sooon. Combining two of the most delicious foods? Genius. I will definitely be trying this soon. Thanks so much Kelly! They are a meal all by themselves. Oh – this is something that my husband would totally love…so many of his favorites combined into one dish! Looks great! How many potatoes to the mixture of salt milk? Just to taste or is this set for a certain amount of taters? The recipe is for 2 decent size potatoes. So the milk, butter and salt with be in proportion with the potatoes.